Are you sick of hearing about Charleston restaurants? Hope not; there’s a few left to go. 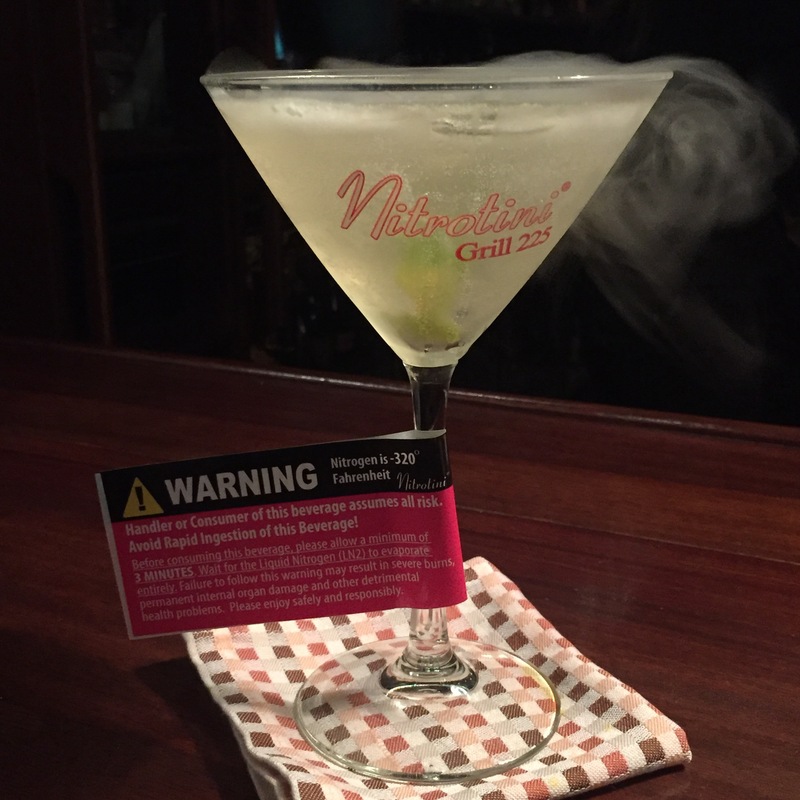 Our final night in Charleston, we had perhaps my favorite drink of the trip, “Nitrotinis” from Grille 225. We arrived just after 6PM for a pre-dinner drink and scored a seat by the bar as the jazz band was setting up shop. That meant we could still talk life and love over our nitrogen chilled drinks. 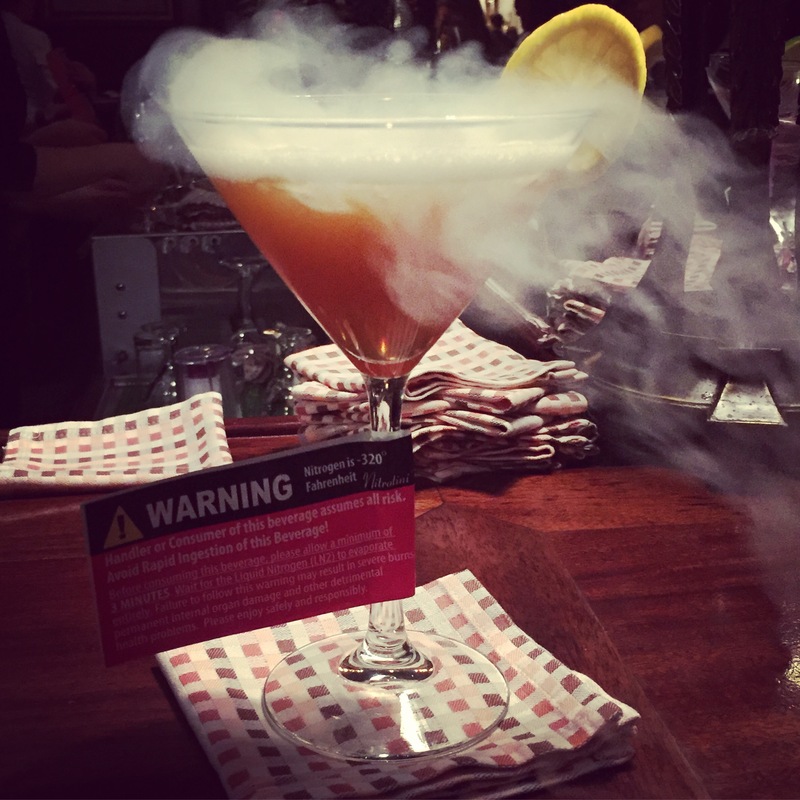 There wasn’t anything different about these cocktails – standard recipes- just chilled with some Nitrogen ice cubes. This made for some fun boomerangs and I would have happily had a second round. Here’s a French 225 (aka French 75). And here is a sangria. After drinks a walk down the street, we arrived at McCrady’s Tavern ready for our dinner reservation. 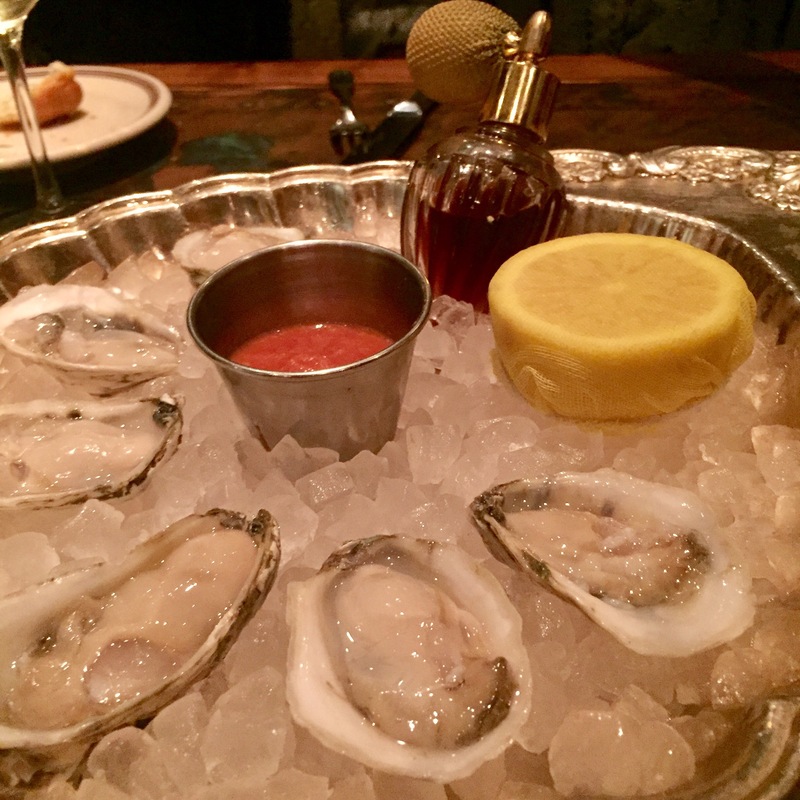 McCrady’s is Sean Brock’s slightly more fancy than Husk restaurant. The menu is a little scattered featuring everything from a burger to recipes from centuries prior. I’d been here once before and thought it was OK, but my friends really wanted to go, so off we went. We were about twenty minutes early to our reservation and thought we might sneak into our table early. Instead, we encountered an extremely rude hostess who told us we could only be seated “close to our reservation time.” When we inquired what that meant, like was the restaurant on time? Or should we come back even later to eat? We were met with some serious bitchy attitude. We’d wanted to have a drink at the bar, but it was full. NBD. So, we walked around the block and had a drink elsewhere. That’s when we learned that we could have been seated at the bar of McCrady’s tasting only restaurant. But, for some reason our bitchy hostess failed to mention this even though she knew what we were after. So, our money was spent elsewhere and our evening began with a bad taste in our mouths. After returning to the Tavern, we were seated and again, enjoyed service with attitude even though we’d ordered a bottle of wine. We’re all really nice gals, but I’m not sure if we were giving off weird vibes, or the staff was instructed to be horrible. Anyway, the food…. 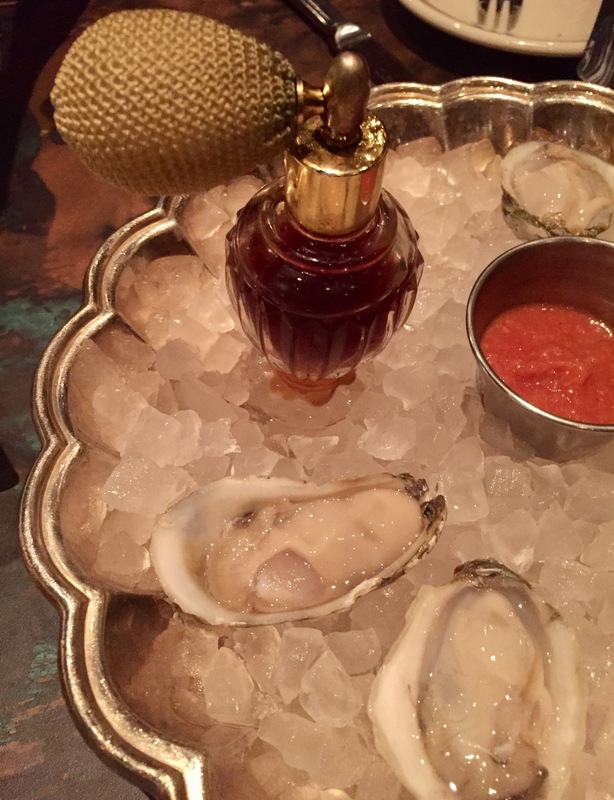 First up, was a plate of oysters where the mignonette sauce was served via old-timey perfume atomizer. Brilliant. And delish, I might add. 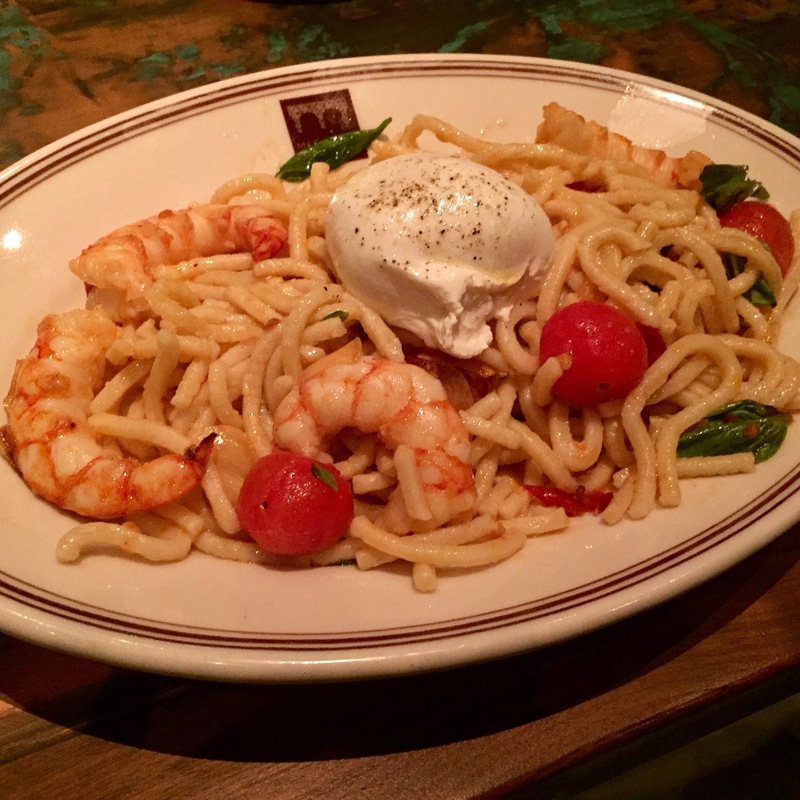 Next up, I had the shrimp pasta with buratta and tomatoes. The pasta was outstanding, the cheese unnecessary and the shrimp..not deveined. My friends insist I send them back. Mainly because their medium-well burger was rare plus. The fresh food was good, but we weren’t impressed enough to order dessert. I’d strongly suggest that you don’t bother eating at McCrady’s Tavern in Charleston. There are so many better restaurants happy to serve you in the area, that the food just isn’t worth the trouble.